Matt C: In many ways, the original Secret Wars series from Marvel was Year Zero for me and my unbridled love of comic books. I’d grown up on comics in one form or another (Beano, Tintin, Asterix, the UK reprint periodical Spider-Man And Hulk Weekly) but when I got my hands on a random issue of the British edition of Secret Wars back in the mid-‘80s, everything changed. Loads of characters I’d seen in solo adventures were suddenly interacting in the same storyline alongside loads of other exciting characters I’d never heard of before. My introduction to Marvel comics happened several years beforehand, but this was my true introduction to the Marvel Universe. And I was hooked. So, yes, there’s a huge element of nostalgia in play here but I also genuinely loved the story too. What was essentially a pure high concept ‘goodies vs baddies’ tale was nudged on a different course into a far more entertaining arena thanks to a certain monarch of Latveria, who decides to play his own game entirely. There’s much more to the series of course, but it certainly did cement by appreciation of Victor Von Doom, which hasn’t wavered to this day. So, a series that had such a life-changing impact on me, getting some sort of 21st century make over, should have riled me something fierce, right? And the main reason for that? Jonathan Hickman. 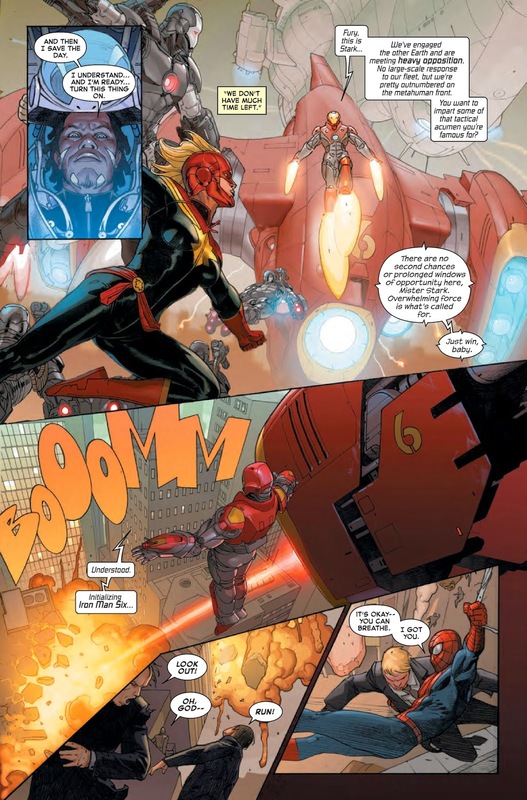 Over the last couple of years, Hickman has made the Avengers-centric corner of the Marvel Universe a vital, compelling, intelligent, thrilling and complex place to visit, month after month, with the twin titles Avengers and New Avengers (as well as an event series – Infinity – thrown in for good measure). Its occasionally po-faced, slowburning approach may have turned some fans off but for me it was invigorating to see Hickman play with some of his favourite themes (man meddling with the destiny of his race being a particularly vibrant one) on such a grand scale and with such familiar faces. Taking a step back and viewing what he’s accomplished since he took over the titles (and arguably those that preceded it like Fantastic Four and Secret Warriors), the sheer ambition is breathtaking. It’s all been leading up to this, his superhero swansong for the publisher (for now), so the question that’s been at the back of my mind has been, can he go out on high note or are we looking at another formulaic, nonsensical event surrounded by endless pointless tie-ins? Well, I can’t speak for the tie-ins (and to be honest, my interest in them is slim) but the early indications from this debut issue are that Hickman is aiming to go out in tremendous style. 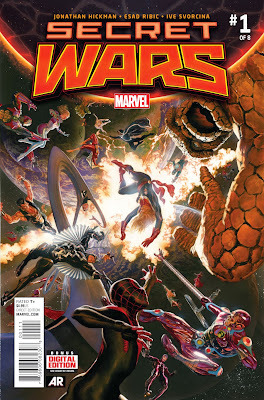 From the ominous opening – one that harks back to the original Secret Wars series – with Doom confronting the mysterious Beyonders, it then never pauses for breath as the final incursion begins, the Earths of the Marvel Universe and the Ultimate Universe about to collide and destroy what’s left of the multiverse, with the Reed Richards of both universes approaching potential salvation from completely different directions. Admittedly there’s an awful lot going on in this double-sized issue, and perhaps some of it is superfluous to the main narrative thrust, but there’s a palpable sense of mounting desperation as the clock ticks down to the apocalypse. Essentially this is a bridge from Avengers and New Avengers to the main body of this iteration of Secret Wars and from that perspective, it works very well indeed. But if you haven’t been reading New Avengers and Avengers? You won’t have a clue what’s going on. It seems a rather bizarre and uncommercial decision from Marvel to launch an event that relies so heavily on knowledge of what’s occurred in two series over the last couple of years or so, but that’s basically what’s going on here. I imagine the next chapter will be a bit more inviting, but for now this feels like the least inclusive crossover series in living memory. That will, understandably, be a problem for a lot of people, but those already on board with what Hickman’s being doing will see this as more or less business as usual.